Saint Ann (Ana, Anna, Hannah or Anne) was the mother of Mary and grandmother to Jesus. Her husband was Joachim (Joaquin). Their combined feast day is July 26th. Normally statues of Mary and Joseph flank an altar. However, in the Santa Anna church in San Miguel (and a few others) it is Ana and Joachim that flank the altar instead. 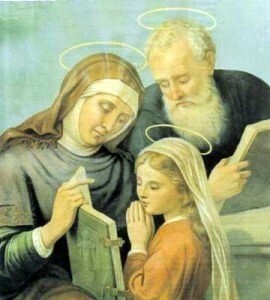 Often the couple are displayed in art, separately or together, teaching young Mary how to read. As the focal point to the Immaculate Conception (becoming pregnant with Mary), Ann is patron saint of fertility issues and pregnancy. The Santa Anna church, alongside the Santa Anna Theater on the corner of Insurgentes and Relox, recognizes this day with fireworks, prayers and celebrations. In addition, every Sunday features a mass in English. The street, Insurgentes, was originally named Santa Ana while Hidalgo was known as San Joaquin.